What can communication professionals learn from the NYT Innovation report? Media as an industry has an ability to cannibalise itself. Journalists are by nature inquirers and investigators. They look for the story and have a need to present it. It is not surprising then that a mountain has been written about the NYT internal Innovation Report. The leak of report, along with the executive departure drove a lot of speculation, commentary, opinion, and tweetage. That a major media organisation would prepare a strategic thought-paper on the future impacts of their market should not be surprising. The Innovation report is a significant thought piece with real lessons for industries well beyond its implications for the paper itself, media and publishing. Nieman Lab does an excellent job of examining the implications from the media industry perspective. There is also some excellent analysis of the content of the report from other commentators, looking at it as a call to action for an organisation needing to reinvent in a changing market. David Armano’s perspective is a standout, categorising the insights into the four topics of agility, culture, talent and customer-centricity. Ezra Klein at Vox highlights the report’s excellent explanation of distruption. This diagram explains the three modes of disruption in the clear style you would expect from NYT writers. 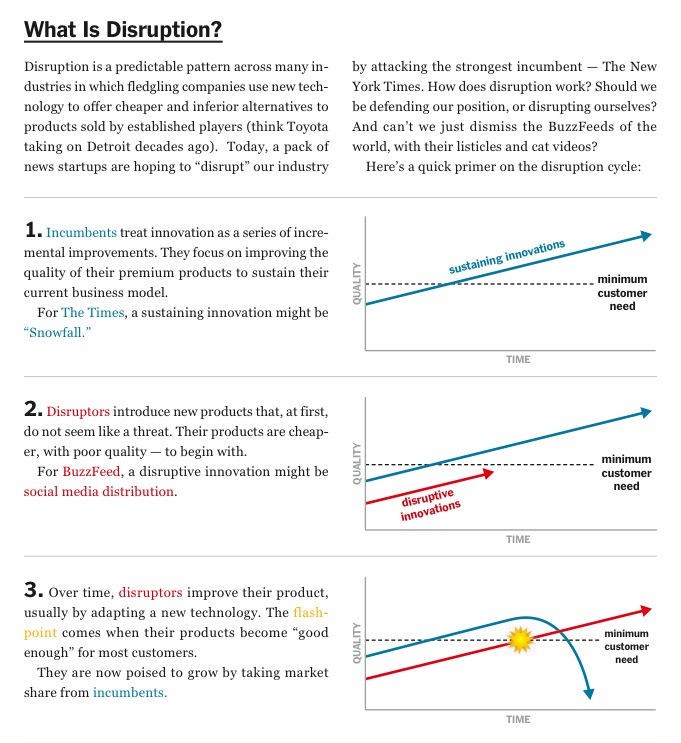 NYT Innovation report’s explanation of disruption, via Vox. Australian workplace and digital analyst Paul Wallbank extracts three lessons for businesses: being digital first, breaking down the silos, and ensuring your business is discoverable. The full report is worth the investment of time to read by any communicator, change agent or strategist. There are a number of change studies that demonstrate that effective context-setting is an important part of enabling employees to sense-make during change. By providing clear background to the market your organisation operates in, you are preparing the field for proactive or reactive initiatives in the future. The NYT Innovation report is an interesting and important model of what that contexualised call to action can be. There are six themes outlined in the NYT Innovation Report that provide a very simple compass for internal communicators considering how to reach employees who are time poor, information-laden and who have different needs. “We need to think more about…packaging our work in more useful ways” With the volume of information growing, reduction and control become limited-success strategies. How do you ensure your content is discoverable, at the right time? Ensuring information is promoted means not just ‘publishing’ but by sharing, by amplifying, and by use of peers. There is a fine balance between push and spam. Segmentation becomes critical, as does understanding the needs of the employee to target promotion of relevant, useful content. Seeking ways to ensure audiences – employees – can participate, comment, create and contribute is an essential component of communication, engagement and change. Whether though user generated content, internal ‘crowdsourcing’, communities, and networks, connection is the the key to relevance and ultimately the path to engagement. Promoting active experimentation, the capacity to fail fast, iterate and learn is a core skill and critical to building the agility of any communication function. Experimentation and connection can work in partnership, through the use of pilot groups, advisory communities and user experience (UX) work. In complex environments, the role of the subject matter expert, the thought leader or the process lead extends to filtering and amplifying key information, themes and messages relevant to their specialisation. Collaborative platforms and enterprise social networks enable this. The competitor cheat sheets in the report are succinct and frank. Do you provide employees with concise information about the others in your market? Is this information purely product and service comparison, or does it go deeper into comparative strengths and weaknesses. I’m interested in communicators views on all aspects of the report – the content, the format, the debate and analysis surrounding its leak. Join the conversation by leaving a comment.